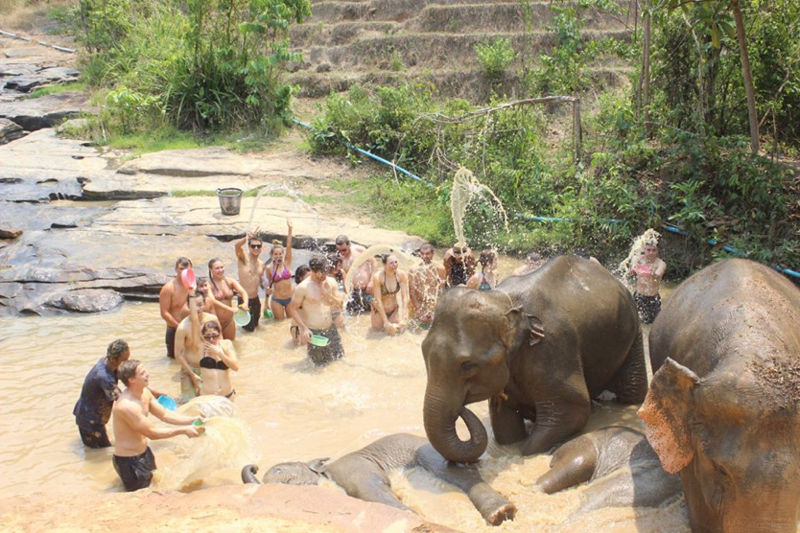 Feed and Bathe with Elephants Here! Chiang Mai, or “New City,” is the capital of the Chiang Mai Province of Thailand, located 700 km north of Bangkok. 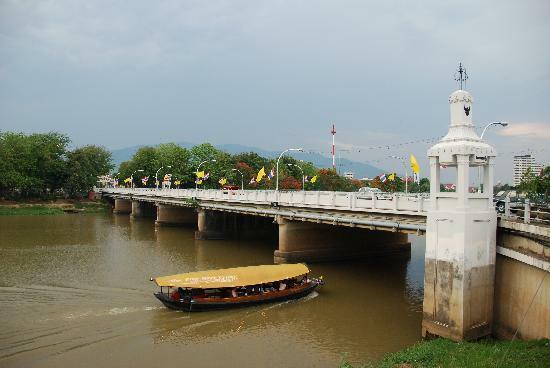 Chian Mai is over 700 years old and is currently applying to have the creative city status with UNESCO. The city is known as the spiritual capital of Thailand, composed of over 300 stunning buddha temples. 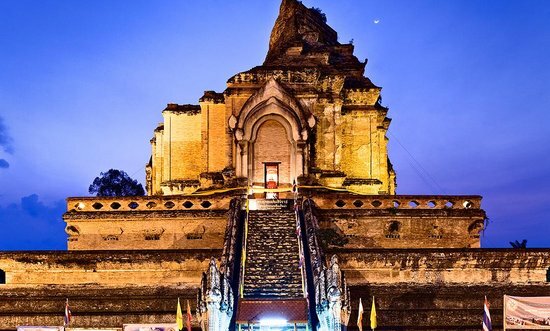 Chiang Mai is known for its beautiful art, culture, history and temples, located all around the city. Forming a great river basin east of the city is the Mae Ping River, part of the Sri Lanna National Park. The Mae Ping is now being revitalized for preservation by the Wildlife Fund Thailand but is nonetheless a stunning site to see. One of the first stops you need to make while in town are the Elephant Sanctuaries. They are a major tourist attraction and one-of-a-kind experience you are not going to forget. When you enter the sanctuary, you will see elephants of all ages waiting for you to feed and interact with them. Don’t be shocked if you get wet – the elephants love to take baths! Be sure to take up this offer and learn more about this incredible mammal. If you just can’t get enough of wildlife, take the Chiang Mai Night Safari. The Safari takes you on a ride through a wildlife park to provide a thrilling experience in the wilderness. You will be touring three animal zones: Predator Prowl, Jaguar Trail and Savanna Safari. For any brave souls out there, you can hand feed the animals and pet tiger cubs (of course under supervision). You never know when you might get this chance again, so don’t miss out! Take time to also visit one of the nine Hill Tribes that are found in Thailand. These tribes have traditional – but sophisticated – customs, laws and beliefs. You can hike through the jungle and discover the tribal villages, spend time with the host, and even sleep in a traditional bamboo house. What an experience! If you are interested in Buddhism, stop by any of the temples located in Chiang Mai. A few of the prettiest and most sacred temples to visit are: the Wat Chedi Luang, Wat Phra Singh, Wat Phra and Wat Suan Dok. Remember to wear long pants and a top that covers your shoulders while visiting any temple in the city, your modesty and respect is greatly appreciated. Locals say that out of all the things to do in Chiang Mai, you cannot miss the Wat Phra That Doi Suthep. This place serves as a temple and built on a mountain, both of which share the same name. The mountain overlooks the entire city from the northwest, and it is home of one of the most beloved parts of the Thailand; the Doi Suthep, Doi Pui and Doi Buakha national parks. Last but not least, check out one of the many Chiang Mai night markets. Some of the most popular markets are the Night bazaar, the Saturday night market and the Sunday walking street; all of these markets offer an abundance of bargains and discounts. The city also has traditional shopping malls, but sticking to the street markets will give you a more traditional aspect of the Thai culture.